Pete Zindler is an accomplished playwright and author of a children’s book, Enoch the Elephant, is also a high school wrestling coach, a bodybuilder, and trained as a UFC fighter. He lives with his family in Ramona, California. He is available for speaking. An Epic Adventure to the Blue Ring Galaxy" breaks new ground with its Christian theme aimed at younger readers of Sci-fi and adventure books. 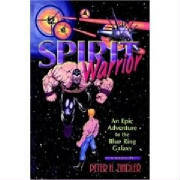 Spirit Warrior has a strong Christian message that is woven throughout all the action and adventure. The story is full of twists and turns and surprises as it takes readers on a journey across new worlds but with old themes from the Gospel. This book is an epic presentation of thoughts and ideas. For those readers who enjoy the "Star Wars" genre of stories this would certainly be something of interest to them. What prompted you to write this book? How did you come up with the idea? other is that Sci/Fi is a tough sell in the Christian world. I noticed that young men hung out in video arcades and that the fight game was one of the popular exhibits. So I portrayed my main character as a No Holds Barred Fighter. In my past I've been the captain of the high school wrestling team, captain of the college wrestling team and Most Valuable Wrestler my senior year in college. So I knew the basic discipline of No Holds Barred Fighting - wrestling. 80% of the champions have that as their first discipline. During the writing of Spirit Warrior, I began training as a UFC competitor. But still I wanted more of an insight into the spirit kingdom. men of the spiritual kingdom. Does this book have a special link to something that happened to you in your life? The book has many links to events that have happened in my life spiritually. It was my intent to share the power in the spirit realm and that there is a war between God and the devil. Often times I would feel the presence of God and His anointing would flow over me. Who did you dedicate this book to and why? I dedicated this book to the Lord. It is for His glory and I was just His pen. of my friends compared my book, "Seeds of Greatness" to him. I enjoy his rich stories. 2) Adventure - Ted Dekker - His stories are action packed and very interesting, fast paced. 3) Historical/Adventure - James Michener - I love the unusual settings and the historical perspectives his books display in a fictional, yet real story. 4) Lawyer novels - John Grisham - Great writer with a keen insight into the court of law and all that surrounds it. Stories are very interesting and quite moving. 5) Crime novels - Michael Connelly - I love his characters and settings. Does this book have a hidden meaning that readers will have to deduce at the end? I hope that the reader learns that the ordinary person can live an extraordinary life in Christ when God is the center of their lives. We are all destined for greatness, all of us, but without God and His ways in our lives, we can't achieve it. How many books have you written and if you have written more than one book, what are the subjects? I've written and published 3 books - A children's book, a science fiction novel, and inspirational book. I've just finished 2 plays. One was produced for Christmas,(The Night Before He was Born) the other one is up and coming. (A Soldier's Journey to Calvary) Also I've just finished the second editing of a military thriller to be sent to the publisher this spring. If you could pick out anyone to read and comment on your book, whom would you pick and why? Steve Laabe - He a Litery Agent in Phoenix. I've heard him speak several times and have had lunch with him and talked to him at length at the various writer's conferences. I like who he is in Christ Jesus and I admire His stand for the Lord. What would you like to have your readers get from this book? I'd like to see readers be encouraged to be all that God has created them to be. To have the courage to walk in the fullness of God in faith and to achieve the dreams of their heart, as God has destined them to do. Have you received any special comments back from any of your readers and can you share them with us? One of my friends took Spirit Warrior home with him and started reading it. He told his wife how good it was and put it down to take a shower. She picked it up and wouldn't give it back until she was finished. At Loaves and Fishes Bookstore in Vista, it was the top selling book for 3 months. Spirit Warrior won the Editor's Choice Award from Iuniverse. Is this book part of a series? Any plans? Yes, I've written a sequel, but need to rewrite it. The twists and turns throughout the book. I don't like predictable plot lines and asked the Lord to give me twists and turns and He did. Then I began writing scenes that I had no idea how I would get out of them and the Lord provided the escape. The book is available at my website, (peterhzindler.com) or Iuniverse.com or Amazon.com or Barnes and Nobles bookstore. Can you give us a 2-minute commercial about yourself so our audience can connect with you?